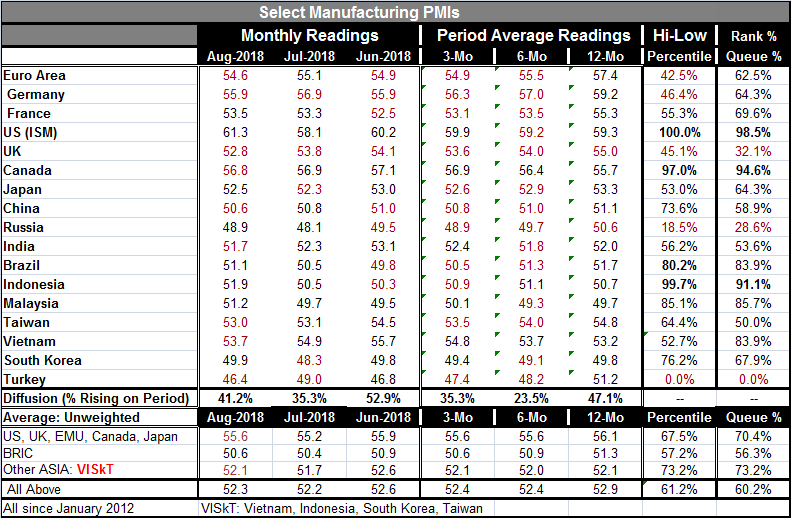 The Markit Global manufacturing PMI data for August are in. And there is a broad manufacturing slowing in place to which the U.S. is a notable exception. Of the 17 reporting units in the table, nine show month-to-month declines. The diffusion data at the bottom of the country detail present diffusion calculations for the 17. In August, 41% of the reporters in the table show improvement. That proportion, of course, is below a neutral 50% reading but better than July's 35% reading. In June 53% improved. Over three months 35% of reporters improved compared to 23% over six months and 47% over 12 months. No country shows improvement over the last three months and the last three sequential periods at the same time. Indonesia and the U.S. come the closest. They are also two of three countries with improvement over each of the sequential horizons; Canada is the third. On the other hand, the jurisdictions with three deteriorations over the sequential periods are Turkey, Taiwan, Russia, China, Mexico, the U.K., France, Germany and the euro area. That's nine of 17 members and fully qualifies this as being a broad slowdown period. Over the last three months, only the UK and China show slowdowns in each month. However, on the more important question of growth, only Russia, South Korea and Turkey show actual declines in manufacturing in August (PMI<50). In July, there were four as Malaysia was a part of that grouping as well. In June, there were five as Brazil also showed decline. So over the past three months, there has been a reduction in the number of countries showing manufacturing contraction despite the overall global weakening trend. The average PMI reading in manufacturing is below 50 in three countries over three months: Turkey, South Korea, and Russia. In addition, Malaysia, Indonesia, Brazil, and China show averages below 51- they are ‘on the edge'. Over six months, Turkey, South Korea, Malaysia, and Russia have readings that average below 50. China averages 51. Over 12 months, South Korea and Malaysia show readings below 50. Indonesian and Russia have 12-month averages below 51; China ekes out a 51.1 reading on average over 12 months. The weak spots are pretty clear. And they tend to congregate in Asia. Among the BRIC countries only China and India stay away from any contraction on these timelines, but China is still skating close to the edge. Queue rankings reveal a different sort of weakness, weakness relative to past trends. The U.K., for example with a raw diffusion reading at a respectable 52.8, has a queue standing of 32.1%; queue standing readings below 50% also are posted by Russia and Turkey. Those readings mean that the current index is below its 5-plus year median. Turkey is logging its weakest reading ever on this timeline. Relatively high queue standings are logged in the U.S. and in Canada with both in their 90th percentile and with the first and second highest raw diffusion gauges in the table for August. However, Indonesia with a pedestrian 51.9 reading also has a 91st percentile standing, a testament to how consistently weak conditions have been in Indonesia over the past five years (...that a 51.2 diffusion reading would be a top nine percentile standing). The foot of the table provides some UNWEIGHTED and consolidated readings for the G7 plus all of the EMU, BRICs and selected other Asia (not Japan and not China). The West plus Japan have the highest diffusion readings for the last three months with other Asia second and the BRICs last. The same is true of sequential diffusion readings. But the current queue percentile standings find the highest readings in other Asia and the lowest in the BRICs with EMU/G-7 in the middle. What these readings tell us is that while other Asia harbors the lowest PMI readings, it is still showing progress as its relative standings are better than the other regions. Overall, the BRIC ranks are still no better than moderate and China is still moderate and close to its median. There is a clear slowing in the West despite its higher overall PMI readings for manufacturing and ongoing weakness in Asia. Contraction is still relatively uncommon and based on monthly data has become less common despite the global slowing. However, today South Africa reported out its second quarterly GDP decline in a row raising the red flag on outright recession there. The silver lining for South Africa is that the second quarterly decline was smaller than the first one so this may be more of a squall than a gathering storm. With the U.S. dollar as the principle reserve asset and as the strongest economy in terms of outright manufacturing diffusion as well as in queue standing, the Fed's decision to hike rates and keep its program of hikes in place seems to be still on solid ground; yet, it will antagonize fellow trade partners where growth is weaker. When interest rates in the center country rise, there is a tendency for rates elsewhere to rise and for the dollar to rise. With the dollar as the reserve unit when the dollar rises, it drives up commodity prices which are priced in dollars and puts an added strain on commodity buyers. At the moment, a hurricane in the Gulf of Mexico is causing drilling platforms to be abandoned and that is separately boosting the dollar prices of oil. There clearly are trends here to watch involving oil, emerging economies, Asia and more. The split in growth between the U.S. and Europe is of particular interest, especially with central banking policies in flux. The weakening of the U.K. economy is also of interest for the same reason and with Brexit in the background. It's no time to get complacent about the outlook... as South Africa reminds us.